Lydia Shackleton (1828 –1914) was one of the early artists-in-residence in Europe. For twenty three years, from 1884 onwards, she painted at the Royal Botanic Gardens in Dublin. She produced over 1500 botanical studies, each time taping a pressed leaf or flower next to her study on paper, allowing for a comparison between the real thing and her copy. Ally Wallace has since 2011, undertaken a series of self-initiated artist residencies in different kinds of buildings, ranging from offices to museums . Each time, at the conclusion, he uses the space he has been working in, whether its walls or objects found within, as his ‘page’. From large paper works and structures to small watercolour studies, all hold details from the surroundings and are presented back to the building, its inhabitants and visitors. The elements he chooses to focus on, whether a section of marble balustrade or a detail from a museum collection, float as fragments on the white page. Whilst still recognisable, the images are always translated into a different colour ways than their real nature. A green piano is placed on the green baize of a writing desk. The pink fold of a marble staircase is given a brown shadow. The act of showing the ‘copy’ within the original space where it was created, affords the viewer a new reading. Plotting out the points where Wallace’s residencies have taken place in Glasgow, many of the buildings are hidden, as the city has adapted and shifted over time around them. In particular, The Martyr’s Public School in Townhead, Glasgow, is a case where motorway meets Mackintosh, with this early work by Charles Rennie Mackintosh only three minutes from The Royal Infirmary and the east end flyover. In subtle ways Wallace’s work observes and reveals these shifts of use and change by casting a democratic and levelling eye over past and present situation in the details he chooses to record. During his residency at Martyrs School, now part museum, part offices, the longer Wallace spent observing, he saw modern office furniture of Glasgow Museums administration set against the Mackintosh tiles. 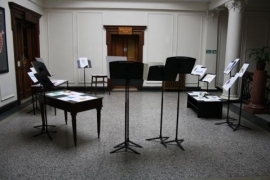 In 2012, Wallace negotiated with the host organisation, Scottish Opera, to allow access for individuals to see the conclusion of his residency at their private administrative offices at 39 Elmbank Street, Glasgow. I slipped out of a busy group residency where the Mackintosh Museum at The Glasgow School of Art had been transformed into an open studio , to visit a building that I had not realised existed, only ten minutes away from my place of work. Once an engineer’s office, the building has a sense of grandeur, with a sweeping staircase that leads up to the landing. Wallace described to me the time shift he felt within the building: “You can look through the windows and where the masts of the ships once were, now the lines of the multi-storey balconies float in front of your eyes.” Here on the first floor landing, I found an ‘orchestra’ of his works, placed in a semi circle on music stands, all lit by natural light from the cupola above. I remember feeling privileged at having been invited for this one-to-one encounter. It is strangely unusual to feel like the work has just been placed there for you to see it. Wallace’s work always moves away from being just a surface reading of a space. The time of the residency allows him to move from a visual response to feeling like he is an element within the building; a ‘member of staff’ rather than a visitor. During Wallace’s latest residency at the Lillie Art Gallery in Milngavie , he used the gallery as an open studio for a few days a week, chatting with any visitors who came through. 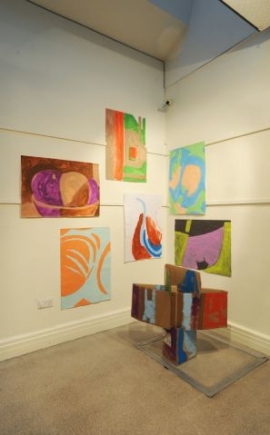 This has resulted in the exhibition ‘Connected Parts‘ (until 20 March 2014). By placing himself so publicly on show as ‘the artist’, he was reminded of the artist figure of Tony Hancock in ‘The Rebel‘ (1961, Associated British Picture Corporation). In the film, Hancock gives up his office job and bowler hat to move to Paris to become a beret wearing artist. With such exchanges between Hancock and his disbelieving art landlady (the wonderful Irene Handel) who is less than charitable about contemporary art – “I’ m not one of the realist school of art, I’m an impressionist. / Well, it don’t impress me.” – the film is satirical in its treatment of the artist having a certain kind of persona and pretentious ideas which he believes no-one, critics or audience, has the right to question. The time spent in the Lillie Gallery allowed Wallace to question his own notions of what a traditional art audience may be and expect from visiting a gallery. In the first gallery, Gallery 2, Wallace produced a freestanding structure, which displays large paper works  with simplified details from bronze sculptures held in the Lillie Gallery’s Collection. The structure creates a new threshold within the gallery, shielding the visitor from the gallery entrance. The physicality of the materials Wallace uses, very much play with the traditional elements within the gallery. The untreated wooden struts of the framework, found in a nearby skip, are the same width as the painted strips of wood forming the double picture rail that circumnavigated all the gallery spaces. 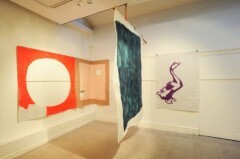 Moreover, the screen’s construction allows for the front and back of the paper works to be presented to the viewer, in a venue that perhaps may predominantly choose a classic museum hang. The paper Wallace uses is roughly cut rather than a standard size. This means the viewer is drawn to the paper’s physicality, as more than just a surface, for example in the detail of the way that the paint has dried, wrinkling the paper slightly. The circular cut out within one of the paper works allows for new views through to a red work on the far away wall. The circle, looking up through it, echoes the circular steel spotlight fitting in the lowered rectangular ceiling. Wallace’s way of working utilises the architecture and detail of the gallery and is not afraid to draw attention to the choices made in the space which make it what it is. The largest painted work makes use of this gallery’s floating ceiling, hung from its edge, creating a paper wall. Another paper work uses the picture rail, but is hung so it follows the contour of the corner of the room, rather like a piece of fabric in its gentle fold and change of direction. In the opposite corner, there is a little collection of smaller works, formally gathered together, around a cardboard structure. Each of works holds a detail from still-life paintings that Wallace chose from the collection. By citing the artists’ names in this part of the installation- ‘After Anne Redpath’, ‘After Leon Morocco’, ‘After Cynthia Wall’– Wallace is very mindful that the collection is part of the DNA of this particular building and that he is, as he puts it, “making art about art“. The roughness of the cardboard totem works well within this arrangement. As the brown of the cardboard still shows through the paint that has been applied to it, it’s surface echoes the tactile nature of the hessian walls, where the grid of the fabric is still archaeologically discernible through the layers of white paint that have covered it over the years. Moving through into the next gallery, Gallery 3, with its blood red interior, this particular space acts like an expanded notebook for Gallery 2 and the residency, including studies of elements of the Lillie Gallery as well as 2d and 3d design ideas for Wallace’s resulting work. Watercolour studies of the linoleum floor pattern in the lobby, as well as observations of the shapes of specific door handles in the venue, show how the artist has made his in depth inventory. Recording the life of the building in such a way, fine tunes how I, as the viewer, spend my time in the space, as well as altering my attention to take in the elements beyond the work. As I move around the space on my second visit, I enjoy the glitter of the gallery floor’s silver surface and eavesdropping on the life of the building, in particular a conversation between the gallery staff and a visitor who is passing time. Subjects for discussion include how to cook pork, the making of shoes for strange shaped feet and a discussion about World War One: “Why do people go to war for no reason, because of one man who upset the caboodle? What a character. He was a real menace”. In coming away from The Lillie Art Gallery, I carry with me an expanded portrait of the building, its inhabitants and the collection it takes care of. 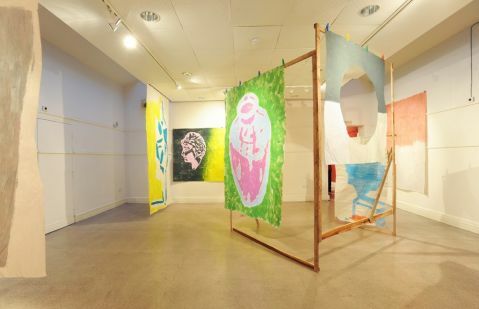 In particular, The Lillie Art Gallery should be commended for placing importance on creating a space within its programme for artists to take the next step in their practice, whether it is Ally Wallace or The Glasgow Group, who exhibited concurrently with ‘Connected Parts’. In particular, I have enjoyed Wallace’s painterly handling of colour, with bold acid yellows and pinks placed next to metallic silver and retiring beige. With the colours resonating in my mind, it seems fitting to conclude with another quote from ‘The Rebel‘, which came out the year before the Lillie Art Gallery was established. 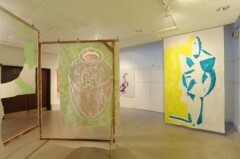 Hancock has come up with an art movement and theory when put on the spot by another painter and calls it ‘The Shape-ists’. 1.Residencies at Scottish Opera’s office in 39 Elmbank Rd; RMJM Architects Hope Street office; and Summerlee, the Museum of Scottish Industrial Life. 3.Milngavie is at the beginning of the West Highland Way, which leads onto 95 miles northwards to Fort William. The Lillie Art Gallery is a municipal gallery which opened in 1962 and has a collection of around 450 works of Scottish art dating from the 1880s to present day. It was built due to a bequest by banker and artist Robert Lillie (1867-1949). 4.In the 19th Century, Milingavie was a minor industrial centre with paper mills and bleach works on the Allander River. It seems fitting that Wallace’s large paper works are here at the Lillie Art Gallery.